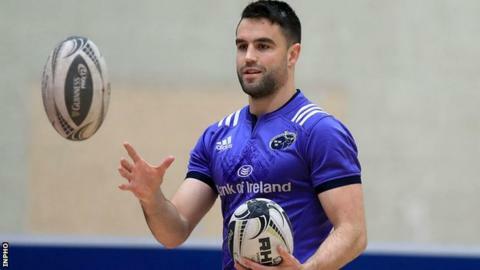 Lions coach Warren Gatland says Ireland scrum-half Conor Murray must play a game for Munster to make the tour of New Zealand this summer. The 27-year-old has been sidelined since sustaining a neck/shoulder injury against Wales last month. Gatland named Murray in his squad on Wednesday but revealed the player had suffered a setback in his recovery. "He's going to need to play before he gets on the plane - that's important for us," said Gatland. Gatland added that Murray has met with a neurologist over a nerve issue and is ruled out of Munster's European Champions Cup semi-final against Saracens on Saturday. Munster also have a maximum of four Pro12 games remaining for Murray to get back in action. "He's got a nerve issue and it is a concern. I spoke to the doctor. He was hoping to be fit this week but he had a setback a couple of weeks ago," said Gatland. "I would be reluctant to take someone to New Zealand with a neck injury who hasn't played. "He's incredibly fit. It's causing him a bit of discomfort and a bit of weakness in his arm, and hopefully he's going to be right in a couple of weeks - the neurologist is confident he is going to be okay."